Primary Natural Resources coconut products, marine products, seabed minerals. THE REPUBLIC OF THE Marshall Islands, formerly a component of the United Nations Trust Territory of the Pacific Islands (administered by the UNITED STATES since the end of World War II), became an independent state in free association with the United States in 1986. The island country consists of 29 atolls and five islands arranged in two parallel chains, known as Ratak (“sunrise”) and Ralik (“sunset”), covering about 750,000 square mi (1,923,077) of open sea. The islands retain a strong U.S. military presence, strategically located halfway between HAWAII and AUSTRALIA, and remain the site of controversial missile testing ranges on a U.S. base at Kwajelein. 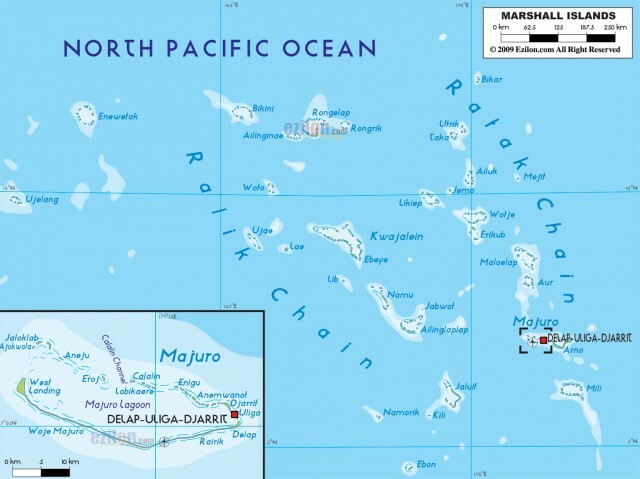 The Marshall Islands are the easternmost part of the former Trust Territory, with the Federated States of MICRONESIA (formerly the Caroline Islands) lying to the west and the former British colony of KIRIBATI immediately to the south. The U.S.-held island of Wake is about 500 mi (800 km) to the north, and Hawaii is located 2,300 mi (3,700 km) to the northeast. Each of the major atolls, crowns of submerged mountains, consists of numerous small islets set in coral reefs surrounding irregularly shaped lagoons—the total number of these islets reaches about 1,150. Kwajalein Atoll has the world’s largest lagoon, with 98 associated islets. But only a few of the islets are large enough to support settlements—most of the population lives on Majuro (Mãjro), and the other major islands of Kwajelein (9,311), Jaluit (2,000), and Arno (1,000). Other atolls or islands with populations above 700 include Ebon, Enewetak, Mile, Namorik, and Namu. Residents of Bikini, Enewetak, and Rongelap were relocated to other islands in the 1950s after U.S. nuclear testing made the islands uninhabitable. The climate is tropical, hot, and humid. The islands are formed of low coral limestone and sand, limiting agricultural output to coconut groves and small plots for melons, taro, and other tropical fruits. The economy is reliant on tourism and fishing, as well as craft items produced from shell, wood, and pearls. Revenue also comes in the form of U.S. financial assistance ($102 million in 1998), both to the central government and to the victims of the nuclear testing of the 1950s, and the usual economic opportunities surrounding a U.S. military installation. The reefs are a major attraction, with several species of coral and five species of marine turtle known only in these islands. The two chains were settled by Micronesians over 2,000 years ago, who named them Aelon Kein Ad (“our islands”). Encountered by Spanish explorers in 1529, the islands remained off the path of European expansion in the Pacific until they were “rediscovered” and named for the British captain William Marshall in the late 18th century. American whalers and missionaries competed with German entrepreneurs, who set up the Jaluit Company in the 1870s as a trading post. Formally declared a German Protectorate in 1886, the islands did not remain under German administration, being occupied by the Japanese from 1914 until they were occupied by the United States in 1944. Nuclear testing began on Bikini in 1946, and the first hydrogen bomb was tested on Enewetak in 1952. The islands were self-governing starting in 1979, and the Compact for Free Association with the United States was finally approved and went into effect from 1986. The United States remains in charge of foreign affairs, and provides financial services and certain federal benefits. Marshall islanders are not U.S. citizens, but are termed “habitual residents,” which allows them to enter the United States and work without visas or work permits. The Marshall Islands became a member state of the United Nations, but continue to be reliant on the United States (financial aid is about 55 percent of the national budget). The Free Association Compact was renewed in 2003.